A fantastic soup perfect for those warm winter days and when you just need something with that home cooked touch that reminds you of something grandma would make! 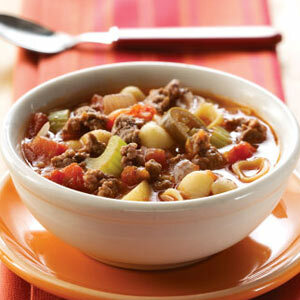 This Zesty Hamburger Soup recipe is easy to make and can be table ready in about 30 minutes and is only 6 Weight Watchers Points Plus so you can stay on track with your weight loss goal! In a Dutch oven, cook the beef, celery and onion over medium heat until meat is no longer pink. Add garlic, cook 1 minute longer. Drain. Stir in the water, potatoes, corn, pasta and jalapeno. Bring to a boil. Reduce heat; cover and simmer for 10-15 minutes or until pasta is tender. Stir in the remaining ingredients. Cook and stir until heated through. Yield: 10 servings (3-3/4 quarts).